My brother-in-law is having a birthday in just a few days. I wanted to make him something special....mostly because my sister-in-law enjoys the cards I make...gotta love my sister-in-law! This sounds silly, I couldn't sleep last night thinking about what I would make. I knew the stamps I wanted to use, and I also knew that I wanted to join the Mojo Monday Week 105 Challenge. I was stumped by what papers I would use. After tossing and tuning for what seemed like hours, I got up and started. This is a half fold card. Bigger than most of my cards. The stamps I used are from Gina K Designs - "Tickle Your Funny bone!" This collection is my first from Gina K Designs. When they arrived I did a big moan because I had to cut them out. I went to her blog page and found a video on just how to do this. It was sooooo easy! The best part, there was no sticky business to mess up my scissors. The stamped images are deeply cut, which is WONDERFUL! I can't wait to use the other sets I ordered. So....what else did I use? 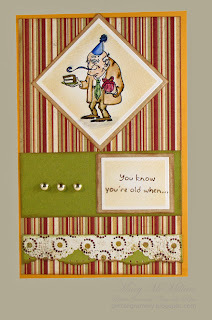 Well....I used Adornit - Carolee's Creations - Cumberland Stripes paper and I also used Infuse by Basic Grey. The green card stock and the brown behind the Spellbinder square and rectangle is from my scrap bin... I don't know who made those card stocks. 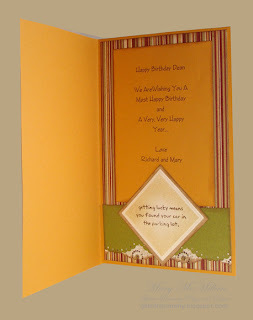 The orangeish card stock was also part of my stash and I don't know who the vendor for this cards stock is. The image was stamped on Strathmore 140 pound water color cardstock. I used Momento Tuxedo Black to stamp my little man and Tombow markers to color him. I stamped the sentiments in Tim Holtz Walnut Stain. The water color paper was edged using Tim's Antique Linen ink. EK Success was used to create the borders. Of course I used Dew Drops. The inside of my card has another one of Gina K's stamps, from the same collection. The Sentiment from me and my honey to my brother-in-law was created on my computer, using Print Shop 22. The outside cardstocks were repeated inside. So...that's what I did. Now it's time to get this card in the mail....I wish all of you a wonderful week filled with many creations. what a fun card. Great take on the mojo sketch. He will love it! You've done a fantastic job. wonderful coloring too I might add. Write moгe, thats аll I have to sау. yоure talking about, why thrοw away your intelligence оn just posting vidеos to your weblоg ωhen you could be giving us something enlightenіng to reaԁ? Sweet blog! I fοunԁ it ωhile surfing around on Yаhoo Newѕ. use WYSІWYG editoгs or іf yоu haѵе to manually codе wіth HTML.